The acclaimed dramedy will fire its torpedoes at Blu-ray this fall. 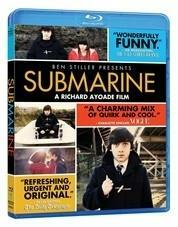 In an early announcement to retailers, Anchor Bay has slated 'Submarine' for a high-definition release on October 4. The enchanting coming-of-age comedy, 'Submarine,' from executive producer Ben Stiller ('Tropic Thunder') and writer/director Richard Ayoade (the cult British television series “The Mighty Boosh”) is based on the novel by Joe Dunthorne and stars Noah Taylor ('Almost Famous'), Paddy Considine ('The Bourne Ultimatum'), Craig Roberts ('Jane Eyre'), Yasmin Paige (the British miniseries 'Murderland'), and Golden Globe® winner Sally Hawkins ('Happy-go-lucky'). The Blu-ray will feature 1080p video, a DTS-HD Master Audio 5.1 soundtrack, and the only supplement revealed so far is The Making of Submarine. You can find the latest specs for 'Submarine' linked from our Blu-ray Release Schedule, where it's indexed under October 4.